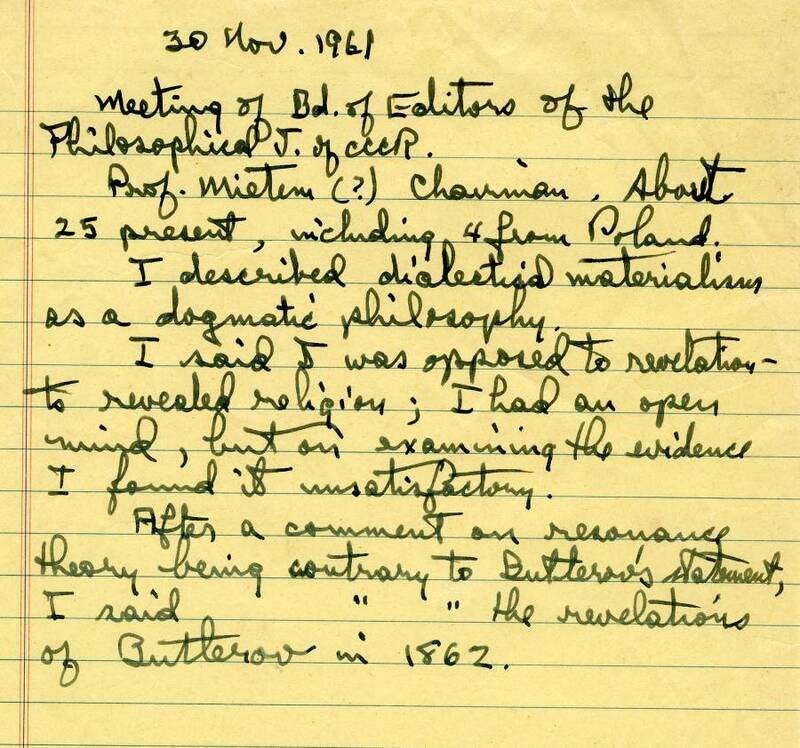 Notes by Linus Pauling documenting one of several meetings that Pauling held with a Soviet science bureaucracy that had formally declared the theory of resonance to be “pseudo-scientific” and “idealistic,” 1961. -Linus Pauling to Frank Aydelotte. September 25, 1951. Just above this, is Voevodsky’s lightly penciled inscription, reading “To the author, In remembrance of your stay in the URSS, 8 VIII 57”. The book that Pauling received from Voevodsky – which is held in the Pauling archive today – is a careful translation done by two Soviet scientists, Ia. K. Syrkin, a chemist, and M. E. Diatkina, a mathematician. Syrkin and Diatkina were two of the Soviet Union’s most prominent sympathizers and popularizers of Pauling’s resonance theory of chemical bonds. Their own textbook on the new quantum methods in chemistry, Structure of Molecules and the Chemical Bond, had been published in Moscow in 1946 and, by 1950, already served as a textbook at Moscow State University. Simon Shnol, a student of Syrkin and Diatkina’s, remembers having attended their lectures on resonance theory in 1950 before its fall from grace. Syrkin’s lectures were full of “brilliant digressions” and “literary analogies,” Shnol recalls, making the complicated topic of quantum mechanics in chemistry seem “accessible and interesting.” Diatkina, somewhat more severe than Syrkin, handled the mathematical aspects of the topic. Typescript by Linus Pauling: “Resonance,” 1946. Shnol attended the 1951 conference at which the official rejection of resonance theory was formulated, believing that it would merely consist of a conversation about the new theories of the structure of chemical bonds. The conference quickly turned into an auto de fe, and Syrkin and Diatkina were severely criticized. While “the majority felt sympathy for Syrkin and did not want to destroy him,” they nonetheless agreed that his propagation of resonance theory in the Soviet Union had been false and dangerous. Syrkin and Diatkina, along with several others, issued official and formal recantations of their views, but their careers were effectively stifled. Both Syrkin and Diatkina were made to leave Moscow State University and Syrkin lost his membership in the Academy (though he retained his leadership of the Institute of Fine Chemical Technology until his death in 1974). Pauling, of course, was not uninformed of the controversy taking place in the Soviet Union. His collection of press clippings is full of mentions and analyses of the resonance theory debate from its inception. I. Moyer Hunsberger acknowledged in his 1954 review of the Soviet resonance theory controversy, “I am indebted to Dr. Linus Pauling for his valuable criticism of this paper. In particular, the contents of footnote 13 were suggested by Dr. Pauling.” Years later historian Loren Graham relied on personal communications with Pauling to construct parts of his article, “A Soviet Marxist View of Structural Chemistry: The Theory of Resonance Controversy,” (1974). Though he seems to have been unimpressed with Syrkin and Diatkina’s own 1946 text, Pauling was nonetheless concerned by the ideological path that Soviet chemistry was taking. In a characteristically humorous way he alluded to these concerns in a lecture he that gave while visiting the Soviet Union for the first time in 1957. In his memoir, Simon Shnol recounts this lecture, which was delivered by Pauling at the Institute of Organic Chemistry in the Soviet Academy of Sciences. It was perfect…with artful gestures, which included his eyebrows, eyes, hands (he reminded me of Louis de Funes), Pauling lectured on the successes of the theory of the structure of chemical bonds….In the lecture room that day the audience separated spatially into three tiers. The most important, high level academic bureaucrats sat in the front rows, the professors and doctors of science sat in the middle rows, and the graduate students filled the back rows. In the course of his lecture Pauling encouraged the students not to repeat the mistakes of those in the front rows (literally: “to not pay attention to them”), a comment that was translated as an encouragement to the students to follow the example of their teachers. Shnol recalls that the discrepancy was immediately noted by many in the audience. Someone from the back rows then shouted an accurate translation of Pauling’s admonition and the room was filled with laughter and noise. The Ava Helen and Linus Pauling Papers contain a large collection of correspondence and publications with marginalia in Pauling’s hand that relate specifically to the resonance theory controversy. Pauling’s collections of photographs, press clippings, reprints and official correspondence, combined with recently-added interpretive material, provide a rich archive of this important and in some ways still unexplored scientific controversy. 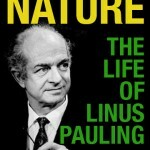 Learn more about Pauling’s theory of resonance from the website Linus Pauling and the Nature of the Chemical Bond, available at the Linus Pauling Online portal.